Sometimes you catch the camping bug a little too early in the season and there is not an open campground to be found. Well, look no further because I found your new favorite pre-Memorial Day campground! Cherry Campground near Springville, Utah is a great place to take your family in the spring. Located up Hobble Creek Canyon, Cherry is a lower elevation campground than most other campgrounds you will find near Salt Lake City. At 5200 feet, the snow melts early and the temperatures don’t get quite as frigid at night. The campsites are surrounded by big trees and the river runs right next to several sites. I recommend making a reservation if you want a spot on the weekends or holidays, but some walk-up sites are also available. Be aware that if you go before the main summer season, running water will not be available. We brought a large water cooler from home and the campground hosts let us know that running water is available at the nearby Jolley’s Ranch if we needed to fill up. 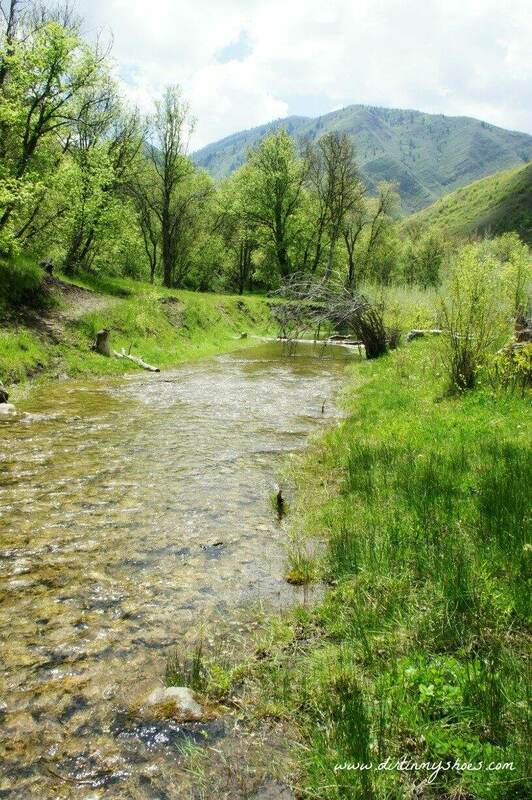 Hobble Creek is great for fishing….and wading. We had a blast just hanging out near the water. John and my brother had various “man challenges” they had to complete, such as who was able to stay under the icy water the longest, etc. I enjoyed sitting on my camping chair on the banks and reading my book. We searched high and low for a great spot on the river, and I have decided to share it with you! Drive one mile up the canyon road from the Cherry Campground. On your left you will see a half-circle dirt parking area with a big fire pit. Park here and cross the street. You will find a small dirt path leading down to the river, and the swimming spot is along the banks where the trees open up to a gorgeous view of the mountains. From Salt Lake City, take I-15 south to Springville exit 260. Head east through the intersection of Main Street and 400 South. At the roundabout at the end of 400 South, turn right onto Canyon Road. Keep going east up Canyon Road for about 6 miles. After passing Hobble Creek Golf Course on your right, the road will fork. Stay to the right and travel another 3 miles or so until you see Cherry Campground on your right. What is your favorite springtime camping spot? As you said, it’s April and not much open for spring camping. Planning to camp in the Springville area next week. Which campground do you like better, Cherry or Diamond Fork? Have you ever hiked to the hot springs in that area? Honestly, both are great choices. It will probably be a little colder at Diamond Fork because of the elevation. And the hot springs are really cool….definitely do that hike if you’re in the area! We drove the road last year after the fire but we’ve never camped there. Such a pretty area. Now if the forecasted rain would just go away. Enjoy your blog, thanks. Just booked our campsite! Thanks for the tip! I can tell my boys are going to love this place! Awesome Heather! Let me know how it goes….and don’t forget to stop by the swimming/wading spot on the river. We had such a blast!